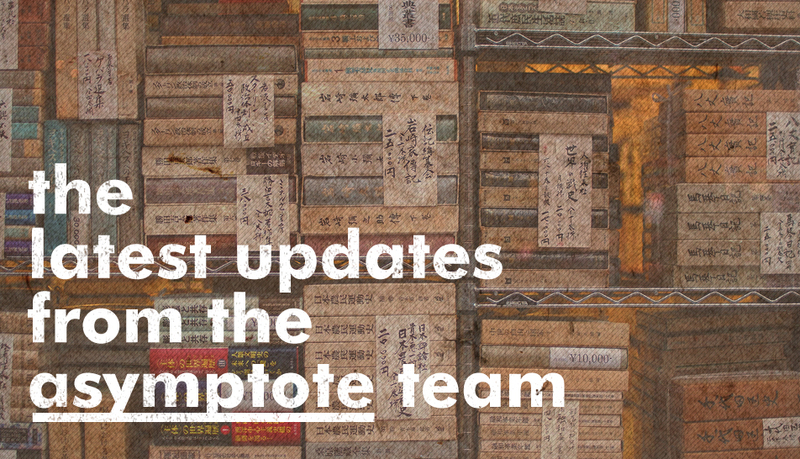 From reading tours to new publications, here's what Asymptote staff have been up to recently! Contributing Editor Adrian West launched his new book, The Aesthetics of Degradation, for the occasion of which former Asymptote Section Editor Matt Jakubowski conducted this interview in Berfrois. Contributing Editor Ellen Elias-Bursać has been interviewed about her authors in Authors and Translators. Assistant Managing Editor Justin Maki published a review of Jon-Michael Frank’s book of poem-comics, How’s Everything Going? Not Good. (Ohio Edit and Cuneiform Press) at The Small Press Book Review. Editor-in-Chief Lee Yew Leong’s translation of ‘Next’, a poem by Taiwanese psychiatrist-poet Jing Xianghai, was featured on the Guardian Books Network as part of Asymptote‘s ongoing Translation Tuesday collaboration with The Guardian. Editor-at-Large for Romania & Moldova MARGENTO (Chris Tanasescu) participated in the CROWD Omnibus Reading Tour, a tour involving 100 writers from 37 countries, starting at the Arctic Circle and ending at the Mediterranean Sea. On his way back, MARGENTO stopped by Bookfest (Bucharest’s International Book Fair) where he contributed to the launch of frACTalia, a Romanian-international consortium of literary journals, publishing companies, and online intermedial archives. Social Media Manager Sohini Basak has poems published in two anthologies: three poems in 40 Under 40: an anthology of Post-Globalisation Poetry (Mumbai, Poetrywala) edited by Nabina Das and Semeen Ali; and a poem inspired by Han Kang’s The Vegetarian in Urban Myth and Legends (Birmingham, Emma Press) edited by Rachel Piercey and Emma Wright. Chief Executive Assistant Theophilus Kwek’s new collection of poetry, Giving Ground, was launched in Oxford, and reviewed in the Oxonian Review. He is one of four winners of this year’s inaugural New Poets’ Prize, and has an interview and a new poem about ’Brexit’ in The Missing Slate.